So the bathroom stuff has basically not been bad at all - the guy shows up on time, works the whole time, and appears to do an adequate job. I've got a couple things that I think are questionable but since I love to control the world I don't know if they are really problems or not. I need advice! One thing was that they used "pared" thinset for the floor since it was already mixed. I believe wall thinset is a little stronger and they say it is "mismo" but is it really the same? The biggest problem is that there are 7 (out of 200) tiles that have problems - they sound different from the others so I think either the thinset didn't bond or the area wasn't (and won't ever be) level or whatever. One I know on the floor was because they walked on it before it bonded - the one in the middle of the floor. When they put it down I told them they should wait until the last thing (but they had thinset mixed already and tried but apparently didn't avoid stepping on it). They did have a large board on it so when they did step it spread the weight out. The other floor had tiny tiles that spanned less area and maybe that was why they didn't have a problem...these are big tiles. Next time a little smaller tile would be better since the floor may not be level and thinset doesn't compensate for that. But anyway - it doesn't rock (yet), we aren't driving on it, it isn't lifting (yet)....what is better? 1 leave it, grout it and watch it OR have them take it out and possibly wreck other ones doing it? It gets grout Monday or Tuesday. The door will be over this area unless you close it when you are in there - but there is no traffic in that area - take them out or grout them in? The other adventure is with the glass wall. I have closely monitored them - I can see what they are doing. but for an instant I blinked or something and when I went in there they were setting blocks on the white track for a dry run....but incredibly had already cut and screwed in the track that was TOO SHORT! I had laid out the wall rows and already snapped all the spacers into the correct shapes for the perimeter, bottom etc and they snatched from the wrong row and everything got mixed up! The guy did a curved glass wall before but apparently had not used spacers (they prefer to just eyeball things I guess) so off it came, I took charge, laid it out with the spacers and told them to measure 3 times and cortar uno or better yet - put the white track down and cut it after the wall is done! The too short piece can be used for the vertical part since the track doesn't come long enough for one piece anyway but jeez... this is basic. So I run down because one guy disappears to mix the mortar and I want to make sure it is the glass block mortar and that he puts in the fortifier (anti mold stuff). I had already piled the two together and marked the ratio so there wouldn't be mistakes. (they prefer to "eyeball" measure which tells me they do this a lot or that they don't do this a lot). Then I told them I was in charge of putting in the spacers so they wouldn't be upside down, or the wrong ones in the wrong place or placed so you could see them (they stay in). We joked around some and they are nice people but I do have to monitor them. So the mortar is not completely filling the outside of the blocks and I am freaking - es mal, no buena, por que no de aqui...lots of pointing. Then they tell me this is the first part and after they put something else to make the lines neat and finish it. I tell them NO thinking they want to grout it and after much discussion I get it - un otro capa de mismo despues - they will neaten it up after the wall is made, dry and then they finish it with more glass mortar so it look nice. The first part is to set the anchors, the metal reinforcers and spaces. So this is what stuff looks like so far.It looks great! The color is off on the photos but I need advice before Monday when they return. 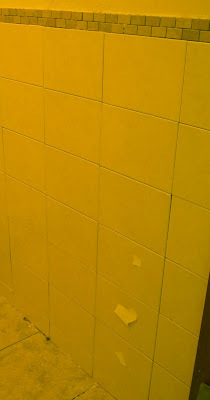 Bust up and replace the bad tiles or leave them and see how it goes. Also, how long before you know if there are really any problems? 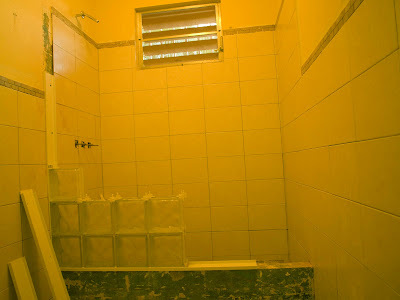 We have the other bathroom to do and if everything holds I think the job is good enough to have them do the other. What do you think? Looks like good progress! Do you have fluorescent lighting? That could be causing the strange coloring in the photos. 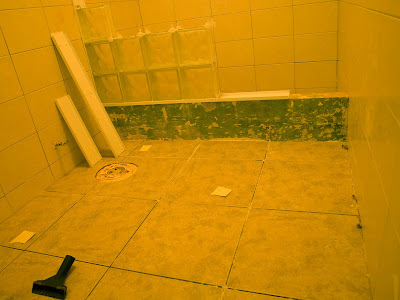 We've never had any problems with our tile jobs so I am not sure how long to wait to see if there is a problem. You should definitely get a warantee/guarantee though. We saw a few lines in the grout in the new rental and we are not sure if that is an indication of something to come. If so, we have a full guarantee of the work so we're not as worried. Cassie - there aren't guarantees - this is Puerto Rico! Maybe if it was a store or something... I haven't paid him anything yet, and for the most part the job appears pretty good. I'll have them bust out the hollow sounding tiles and they probably won't want to do it a third time! The house is 30 years old and thinset isn't meant to level things. Nothing is perfect.